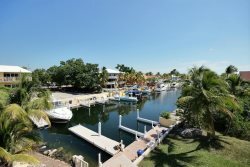 Budget condo rental in the heart of Key Largo! Discover your own private escape at villa 334 in what is uniquely Mariners Club Resort and Marina where paradise and luxury come together as one. We invite you to spend enchanting evenings and unforgettable days overlooking the Atlantic Ocean from your private villa where time passes slowly and your dream vacation becomes a reality. The glistening marble tile floors of this 2 bedroom, 2.5 bath, 1800+ sq ft villa accentuate the hand-picked island-style furnishings and local, custom commissioned artwork grace the walls. The awe-factor of the kitchen is unmatched and will be any chef’s delight! An open floor plan lends to the spacious feel of the villa and affords plenty of room for friends and family to mingle. The dining table seats 4 comfortably, the breakfast nook seats 4 and the breakfast bar offers another seating option for a quick snack while on the go. The master bedroom has a king bed with full lux ensuite bath, a grand spa tub, separate glassed shower as well as his-n-hers granite topped vanities. A guest master also offers a king bed with full ensuite bath. Both bedrooms are outfitted with large, flat-screen TVs as is the living room. Villa 334…where nature and luxury exist harmoniously. Everyone is very helpful and organized. Love the Mariners Club, lovely gated community. Our experience at the office with Debbie went very well as well as the rental, which far exceeded our expectations. We were very happy with Barefeet Rentals. Very efficient and always answered the phone when we called! Great pleasure to deal with. Very friendly, pleasant, knowledgeable people. Place was amazing. Unit and complex was perfect. Wow is only way to describe that unit. Loved it. Loved every minute of it. The entire rental process was very pleasant, from your very thorough and accurate website to your prompt responses by phone and email. We also appreciated your timely information package and the check-in and check-out reminders by email. Your check-in was so efficient, with the guest folder and keys ready to go - the process took less than 5 minutes and so was check-out! Villa 334 was beyond our expectation! It was like staying in a luxury model home, so beautifully furnished and decorated.